They call it Rosella in Australia. That's what I learned when I started searching online for Hibiscus Jam recipes. And just like any other given thing, there are many ideas about how it should be done. I focused on the recipes that measured the fruit and sugar by weight, hoping for greater accuracy. To add or not to add lemon juice? I couldn't understand why - the fruit is quite tart - so I didn't. How much sugar then? Of the two recipes that made it to the championship round, one had twice the amount of sugar as the other. I compromised and weighed out an amount equal to 1.5 times the weight of the fruit. I'm calling it fruit here because I'm tired of typing calyces, even though that's technically what they are. Having decided on a recipe, I had to gather up some equipment. Where is my 5-quart pan? Not here. OK, I'll just make a smaller quantity. Oh, and I'll need some canning jars and a canning kettle. Two hours and four stores later I had the jars but not the kettle. Well, maybe the stockpot would work. I have a cake rack that will fit in the bottom - oops, no, it's a fraction of an inch too big. How about the old collapsible steamer basket? But the bottom isn't flat. But it's all I have. OK fine. This is an experiment anyway. No jar lifter. What about tongs? Yeah, but where are they? Never mind, I'll use a couple of big slotted spoons. I measured out 200 grams of hibiscus fruit (calyces with the seed pod removed), chopped them somewhat finely, and set them in a 3-quart pan to simmer with somewhere between 3/4 and 1 cup of water (not quite enough to cover the fruit). I let that simmer for 20 minutes and added 300 grams of white sugar. 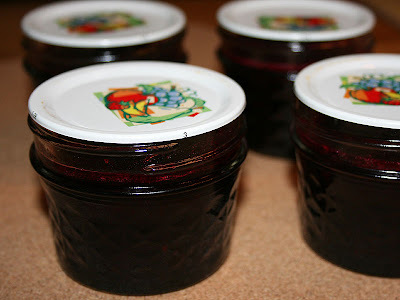 Simmered for another 20 minutes, uncovered, and packed into 4 4-ounce jars (hot from the dishwasher). Put the lids on and processed for 10 minutes in my improvised water bath canner. I was so concerned that it might not gel. I needn't have worried. The end product is very firm. How to correct this next time? More water? Less cooking time? But never mind that. This stuff tastes really good! 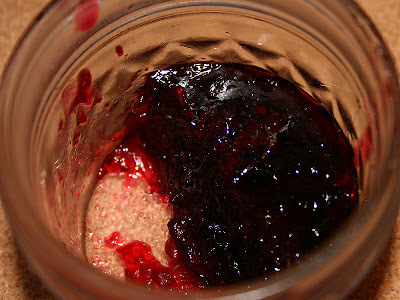 It's not it's like some inferior version of a "real" fruit jam, made out of necessity from available ingredients. Some have compared it to cranberry, and yes, it's something like that. There's no astringency though. To me it has a haunting, faintly floral, unidentifiable "red" flavor. I am definitely going to make this again. Some would say that Fish Tacos are already multicultural, speculating that they may have originated when Japanese tempura met Mexican tacos. Last night we mixed it up even further, adding Trinidad Pepper Sauce and Salvadoran Curtido to some cornmeal-crusted cod for some very tasty tacos. First off, I made a small trial batch of Nicole's sister's Trinidad Pepper Sauce. I didn't grow Habaneros this year, but I thought I could approximate the taste by combining Ají Dulce peppers (which taste like Habaneros with no heat) with the hottest peppers I had available - Lemon Drop, Prik Ki Nue, Bellingrath Gardens Purple, and Purple Cayenne. I was trying to stay with ripe peppers, but not enough of the very hottest ones are ripe yet so I had to use a few green ones as well. And I was afraid that too many green peppers would muddy the color of the sauce, so I used some of the less hot varieties - Serranos, Czechoslovakian Black, and Fish - which were ripe. This is the 4 ounces of peppers needed to make the recipe at 1/4 the original amount. This turned out to be a hot sauce, but not as hot as it would have been with all Habaneros. And that may have been a good thing because we used it somewhat generously on the fish tacos and thought it was just right. 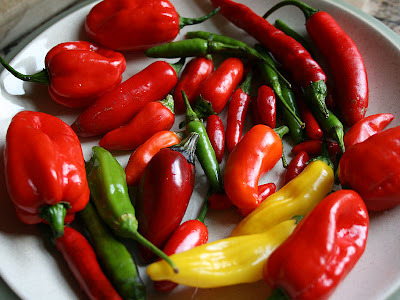 I plan to make another batch when I can fill the hot pepper quota with ripe Lemon Drop and Prik Ki Nue peppers, and that should be closer to the habanero heat level. When we were first introduced to fish tacos, they were topped with thinly sliced raw cabbage, but one of our favorite Mexican restaurants serves marinated cabbage as a side dish with their fish tacos. I assume it's the same as Salvadoran Curtido. My version was a little different in that I used very little vinegar. I thinly sliced one quarter of a small head of cabbage, salted it and left it to drain in a colander for about half an hour. I then rinsed it, squeezed it as dry as I could, and mixed it with thinly sliced yellow onion (about 1/4 large onion) and one green Serrano pepper, sliced paper thin using a Benriner mandoline. Then I added just enough rice vinegar to moisten, and a small amount of sugar. This mixture stayed almost as crunchy as raw cabbage (even overnight) but much more flavorful. The fish got a Southern US treatment - dredged in cornmeal and deepfried. I cut a fillet of cod into strips about 1/2 inch wide, patted them dry and coated them with cornmeal. Nothing else. Sometimes I season the cornmeal, but this time I just salted the fillets lightly after they were fried. The final step for the cook was to heat some corn tortillas. Around here each diner is responsible for his/her own tacos after that, assembling them with one or two pieces of fish, some hot sauce and the marinated cabbage. Inner Beauty is a hot sauce with a large crowd of admirers. Just Google Inner Beauty sauce and you'll see what I mean. I don't remember exactly when I first tasted Inner Beauty, but it was probably in the late 1980s. I saw it on a store shelf and thought it was cute. It followed me home. We didn't really know what to do with it. Tasted it and thought it might be good as a sauce for grilled meat. 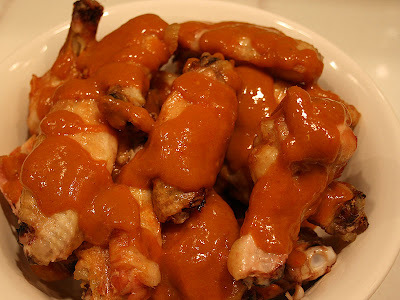 The first time we tried it out, we used it as a basting sauce for grilled chicken. And the second time and the third time and ... I don't think we ever used it any other way, except that the chicken was sometimes pork chops. Time passed. The sauce disappeared from the store where we'd been buying it. A few years later we spotted a bottle again (somewhere), but it didn't look quite the same. Label change? We weren't sure, not having bought any in a long while. Well, we bought it anyway, but it didn't taste quite the same either. Maybe it changed, maybe we changed, but at any rate we never bought another bottle. And then we forgot all about it. Until a couple of weekends ago when we were talking about spicy condiments and one of us said "Hey, remember when we used to put Inner Beauty on chicken and pork chops on the grill? I wonder if we can still buy that stuff?". No. But supposedly the recipe is in a book (Big Flavors of the Hot Sun) by Chris Schlesinger, the originator of Inner Beauty. Well, yes, except that recipe isn't the same as this other recipe by the same cook and author. And neither one is the same as the list of ingredients on the label of the bottled sauce according to this post on eGullet. But I don't usually follow recipes to the letter anyhow, so I took those as suggestions and started blending. No wait, first I went shopping. I don't usually have papayas around the house, but I'm lucky to live near a Korean/international supermarket and they have 2 or 3 brands of tropical fruit purees in the freezer case. And I picked up a bottle of pineapple juice concentrate. And some orange juice. Now stocked with tropical fruit juices, concentrates and purees, I got the rest of the ingredients from the garden and pantry. I didn't grow any habaneros or scotch bonnet peppers this year, but I do have Ají Dulce and Lemon Drop and Prik Ki Nue. I assumed those would give the flavor (from Ají Dulce and Lemon Drop) and heat level (Lemon Drop and Prik Ki Nue) I was aiming at. Then, I added a few other pepper varieties for good measure - Czechoslovakian Black and Aci Sivri because I like their fruity flavors and Fish for additional heat and color. Chop the chile peppers fine in a blender. Add fruit juices and fruit and continue blending until mixture is fairly smooth. Add sugars, molasses, mustard and vinegar and blend. Since this was an experiment, I tasted and took notes while measuring and adding ingredients until I thought it tasted good. I couldn't stand the idea of putting raw curry powder and turmeric into this or anything else, so I heated a small amount of oil in a small frying pan and sizzled the spices in it for a few seconds as in the Indian cooking technique of tarka or phodina. As soon as that was fragrant and sizzling, I poured the spice mixture into the blender, added the salt, and blended until I thought it was as smooth a mixture as I was going to get. So how did it turn out? It was more fruity and less mustardy than we remember the bottled sauce. And I'm ambivalent about the ground spices; I didn't think they were really necessary so I used them in token amounts which had very little effect on the finished product. The sauce was not blazingly hot, but I don't remember the original bottled sauce as being all that hot either. For the first use, I marinated some pork chops in it and we grilled them without additional basting and found the heat level just about right. Last night though, I used it as a sauce for chicken wings, and we thought it would be better if it was hotter. But here's my problem. It's not the same as the bottled sauce, but my spouse says it's better than the bottled sauce. Now what do I do? Keep making it this way to please the spouse? Or try to get it closer to the bottled product? I may taste some of the supposedly similar commercial products for reference. I'm thinking of Lottie's in particular. Anybody else have a favorite hot sauce? There is an unwritten rule of summer: You cannot throw away fresh tomatoes - any fresh vegetable, really - nor can you allow them to go to waste. Tom invited my husband and me for dinner recently, warning that everything he served would have tomatoes in it because the tomato plants in his backyard were bursting. "I've had tomato sandwiches every day for lunch," he said gleefully. Red orbs perched on the windowsill and by the sink. A bowl of a dozen or so round things wrapped in newspaper sat nearby. "Storm knocked down the Celebrity," he said, referring to one of the varieties. "So I picked these up." 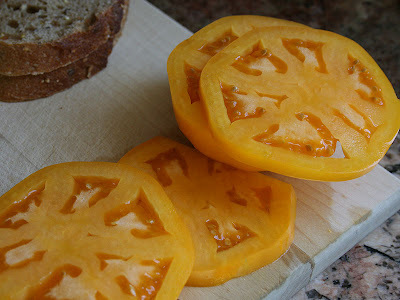 He used some in a fried green tomato sandwich, which he described in lip-smacking detail. That was written in the year 2000, but the author, Debbie Moose, is still writing about tomatoes. For today's lunch, we're going to take a break from BLTs and have Potatoes and Onions with Tomatoes, more-or-less based on a recipe in Curried Favors by Maya Kaimal (page 8 in the pdf file of excerpts from the publisher). With leftover fish from last night's Fish Tacos. Bread: Costco store-baked Whole Grain and Mini-Baguette (more like a mini-boule). Ran out of whole-grain bread and had to make up the deficit with the baguette. Results: Persimmon tomatoes make perfect sandwich slices, Niman Ranch is my current favorite bacon, and the mayo-mustard-honey makes a great BLT sauce. Good sandwich!